Stan Kroenke said he understands the emotional side. But "I have a responsibility to the organization to have a first class facility." The moving trucks lining up at Rams’ Park will mark the second time since 1988 that an NFL squad departed from the Gateway City. It’s unclear whether the city will get another chance at hosting that professional sport. “This has been the most difficult process of my professional career,” said Kroenke in a statement. “While we are excited about the prospect of building a new stadium in Inglewood, California, this is bittersweet. St. Louis is a city known for its incredibly hard-working, passionate and proud people. Being part of the group that brought the NFL back to St. Louis in 1995 is one of the proudest moments of my professional career. Reaching two Super Bowls and winning one are things all St. Louisans should always treasure." The main provocation behind Kroenke’s relocation maneuver was a clause guaranteeing a “first-tier” stadium. That clause came back to haunt St. Louis, especially since the Edward Jones Dome hadn’t kept up with lavish facilities built in Dallas, Indianapolis and San Francisco. “While there understandably has been emotionally charged commentary regarding our motives and intentions, the speculation is not true and unfounded," Kroenke continued in his statement. "I am a Missouri native named after two St. Louis sports legends who I was fortunate enough to know on a personal level. This move isn’t about whether I love St. Louis or Missouri. I do and always will. No matter what anyone says, that will never change. This decision is about what is in the best long-term interests of the Rams organization and the National Football League. We have negotiated in good faith with the Regional Sports Authority for more than a decade trying to find a viable and sustainable solution. When it became apparent that we might not be able to reach an agreement, it was then and only then that we looked at alternatives." The Rams also cited the city’s middling population growth and diminishing attendance in his relocation application (which St. Louis Public Radio explored and dug into the evidence of those claims here). It certainly didn’t help efforts to pack the dome that the Rams haven’t had a season where the team won more than eight games since President George W. Bush’s first term. Still, Missouri Gov. Jay Nixon partnered with local political and business leaders to try to keep the team here soon after Kroenke revealed plans to build a largely privately funded stadium in Inglewood. The Democratic governor championed a $1.1 billion riverfront stadium proposal, which many touted as a way to prevent the Rams from bolting. Supporters also contended the new stadium would spruce up a drab part of the city’s riverfront. But that effort didn’t go smoothly. Backers of the stadium proposal resisted having referendums in either St. Louis or St. Louis County to approve public. That almost certainly led to St. Louis County being taken out of the funding equation for the facility – and prompted some backlash from some St. Louis political figures. Nixon also upset lawmakers from both parties with the idea he could issue state bonds for the project without a statewide or legislative vote. Even if owners had rejected Kroenke’s bid to move, Missouri lawmakers were on track to pass a bill – and override a veto – barring Nixon from issuing stadium debt by fiat. Some supporters of efforts to keep the Rams did little to disguise their disgust with the result. 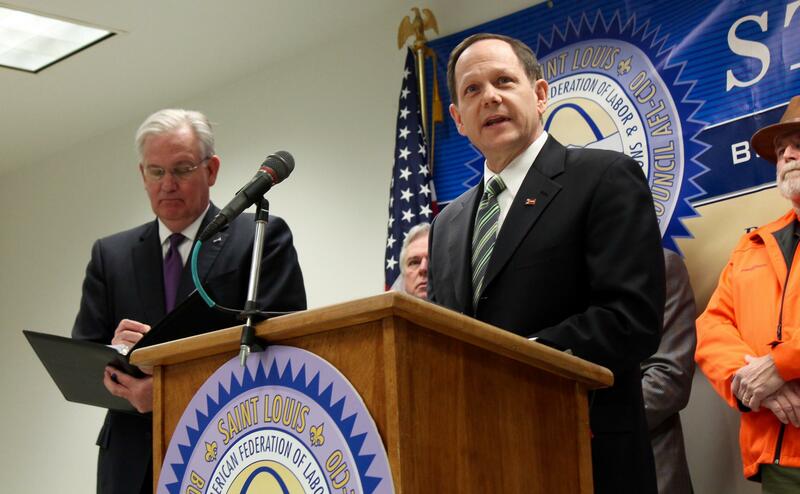 St. Louis Mayor Francis Slay talked of 24-hour shifts to build a riverfront stadium at a conference last year. In a blistering statement, St. Louis Mayor Francis Slay said the "NFL ignored the facts, the loyalty of St. Louis fans, who supported the team through far more downs than ups, and the NFL ignored a strong market and viable plan for a new stadium." St. Louis County Executive Steve Stenger said in his statement that he was "bitterly disappointed in tonight’s news." He added, "This region deserves an NFL team." And for his part, Nixon said the owners' "decision is disappointing, and a clear deviation from the NFL’s guidelines." It is troubling that the league would allow for the relocation of a team when a home market has worked in good faith and presented a strong and viable proposal. This sets a terrible precedent not only for St. Louis, but for all communities that have loyally supported their NFL franchises. Regardless of tonight’s action, the fact remains that St. Louis is a world-class city deserving of a world-class NFL team. We will review the NFL’s decision thoroughly before determining what next steps to take. In particular, we are interested in their justification for departing so significantly from the NFL’s guidelines after St. Louis had – in record time – presented a proposal for a first-class stadium. The task force that Nixon appointed released a statement as well, contending that the "NFL concludes a flawed process that ends with the unthinkable result of St. Louis losing the Rams." "Over the past 15 months, our stadium task force has delivered in every respect to what the NFL demanded of St. Louis to keep our team. More important, over the past 21 seasons, most of them dire, St. Louis has been remarkably supportive of and faithful to the Rams. We will leave it to the NFL to explain how this could happen and hope the next city that may experience what St. Louis has endured will enjoy a happier and more appropriate outcome. "Here in St. Louis and throughout our region, we are incredibly grateful for the energy and support we received during this journey. What St. Louis was able to accomplish in a very, very short time was, and is, amazing. That our collective efforts will not be rewarded, or recognized, is very unfortunate. We all deserve better, but never forget that we just showed everyone and ourselves what St. Louis is capable of achieving. The best days for St. Louis are not far away." Now that the Rams are gone, St. Louis may not have a chance anytime soon to land a team. It’s possible that policymakers may turn their attention to luring Major League Soccer here, especially given the sports’ popularity within high schools and with a growing Bosnian population. It’s also possible that the departure of the Rams frees more space for conventions, which tend to be lucrative for downtown St. Louis’ hotels and restaurants. Many convention slots were blocked off during the fall during the Rams’ season. Yet despite the fight to keep them, the truth stings for football fans: Los Angeles has taken back the Rams. And a professional football will soon become a memory for our city. Does the NFL have a future in St. Louis? We'll find out this week. After more than a year of twists, turns, deal-making and uninspiring play on the football field, NFL owners will take a vote determining the future of professional football in St. Louis. The leaders of the league’s 32 teams are scheduled to meet on Tuesday and Wednesday in Houston. They’re slated to take up proposals from the St. Louis Rams, the San Diego Chargers and the Oakland Raiders to move to the Los Angeles area.